Welcome to Mutant Academy, a new weekly series where I will explore the ups, downs, and huge doses of teenage angst in the 2000-2003 X-Men Evolution animated series that originally aired on Fox Kids. This cartoon, along with the Spider-Man, X-Men films, and Dark Knight trilogy, helped get me interested in superheroes and comic books. I definitely recall watching a few episodes here and there at friends’ houses in elementary school, but didn’t watch the series all the way through until Marvel made available on YouTube back in 2010. I had just seen Iron Man 2 and wanted to immerse myself in the Marvel Universe. X-Men Evolution was the perfect primer to the mutant side of things. Well, after that overly personal intro, let’s dive into X-Men Evolution‘s pilot “Strategy X”, which aired on November 4, 2000 about three months after the first X-Men film came out in theaters. There is a story credit to Avi Arad, the chief creative officer of Marvel Entertainment and the producer of all the Marvel films from Blade to 2008’s Incredible Hulk, and Rick Ungar, the president of Marvel Characters group. And along with these big wig film execs, animation veteran Bob Forward (Incredible Hulk, Transformers: Beast Wars) wrote the teleplay, and “Strategy X” was directed by Frank Paur, who worked on 90s cartoon heavyweights Batman: The Animated Series and Gargoyles. 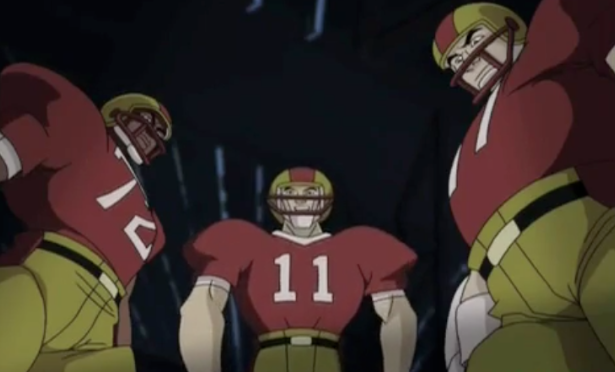 The episode opens during a high school football game showing that X-Men Evolution is going to be about the X-Men struggling with high school and growing much as much as supervillain albeit the TV-Y7 version of high school. At the football game where Cyclops (Kirby Morrow) is attending as a fan, and Jean Grey (Venus Terzo) is there for the school paper, the bodily odor rocking mutant Todd Tolansky aka Todd (Noel Fisher) is stealing wallets. The quarterback of the Bayville High football team, Duncan Matthews (Vincent Gale) beats him up for his crime, but then Cyclops defends him, his visor gets knocked off, and part of the stadium comes down. Luckily, Professor X (David Kaye) is there to wipe everyone’s minds while severely scolding Cyclops. 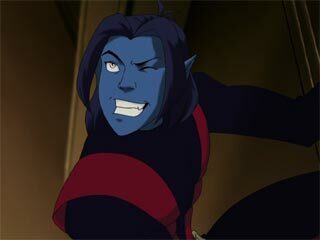 The main thrust of “Strategy X” is introducing the mission of the X-Men as well as the Xavier School for Gifted Youngsters as the German teleporting mutant Nightcrawler (Kirsten Williamson) joins the team. He is afraid that people will continue to persecute him for his blue fur, but he finds a home at the school. Except things get complicated when Principal Darkholme (aka Mystique in disguise) (Colleen Wheeler) sends Toad to infiltrate the school. 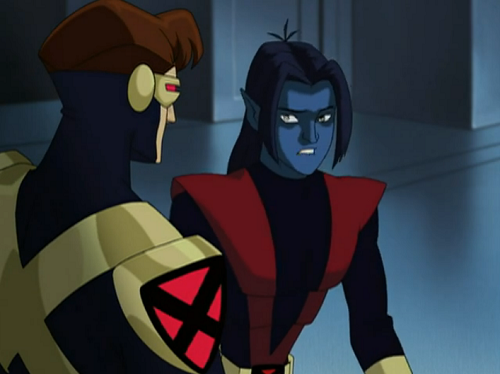 He kind of fails at it and ends up breaking lots of windows and tussling with Nightcrawler in the Danger Room before peacing out when Wolverine (Scott McNeil) returns to teach (probably art) at the school. The episode ends on kind of a heartwarming note as Cyclops persuades Nightcrawler to stay at the Institute with the promise of acceptance, eventually flying the special Blackbird jet, and free sodas. On the more evil side of things, Magneto (Christopher Judge) makes an appearance and tells Mystique that every mutant even Toad has a role to play in his upcoming plan. He’s in the episode for a split second, but Judge’s super deep voice, the minor piano theme for him, and the paper clips slowing lifting from Darkholme’s desk create a great first impression for the Master of Magnetism. Even though Cyclops attempting to use “hip teen slang” makes my ears bleed, he comes off better in this one episode of X-Men Evolution than any of the original X-Men movies, which were centered around Wolverine too much. Morrow plays him with a blend of awkwardness and authority. When he comes to Toad’s aid, he seems large and in-charge, but later, he calls Professor X and freaks out about Toad using his powers openly at school. Power and awkwardness find its way into Frank Paur’s direction as he confidently punches out a couple jocks and takes out Danger Room machines with his optic blasts, but also struggles to get his boots on while he and Jean try to rescue Nightcrawler and Toad from the Danger Room. Jean Grey doesn’t have much to do in the main plot, but she gets some great sassy lines of dialogue from saying that a picture of Duncan scoring a touchdown is for “private collection” to observing that she and Nightcrawler have an angel/demon thing going on in the Danger Room. Sadly, her role is similar to Jean’s role in the Stan Lee/Jack Kirby X-Men comics, which is supporting the male characters with her low level telekinesis. 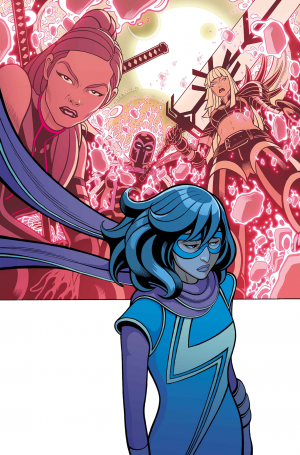 But she and Storm basically clean up everyone’s mutant powered mess by the time the episode wraps up with well timed object movement and lightning storms. 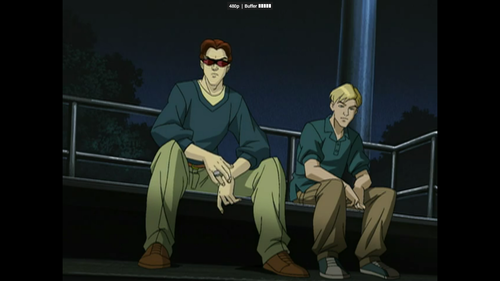 In X-Men Evolution, Storm and Wolverine are older than Cyclops, Jean Grey, Nightcrawler, and the other X-Men and are teachers at the Xavier Institute. They play peripheral roles in “Strategy X” with Storm helping Professor X show Nightcrawler around, chauffeuring him to the football game, and finally getting to cut loose with her powers when the Danger Room goes amok. Wolverine gets to be gruff, ride a motorcycle, and there is a glimpse of Sabretooth teasing at a plot down the road. With David Kaye’s pitch perfect impression of Patrick Stewart’s Professor X providing the philosophical underpinning as he provides a shelter for teenagers, who are hated and ridiculed for their looks and abilities, “Strategy X” recasts the X-Men mythos into a high school setting. The X-Men aren’t shuttered away at a boarding school, but go to football games, eat lunch in the cafeteria, and even get bullied. Their training with superpowers is just a very intense extracurricular program. This is a solid idea for a multi-season TV show, especially down the road, with the Brotherhood and X-Men at the same high school even if Toad isn’t a very impressive opponent, and Mystique’s superpower seems to be yelling early on. -Watching this show in 2016, it’s kind of scary to see how easily Duncan Matthews shakes off the concussion he got from Cyclops’ optic blasts. -Wolverine cutting off the top of a water bottle with his claws and chugging it before he leaves the convenience store is all you need to know about his character. -Storm tries to see what happens when a toad gets struck with lightning when Toad breaks into the X-Mansion. But she comes up empty because of Standards and Practices. Somewhere, Joss Whedon is crying, but also smiling because this show is kind of like the less sexier, East Coast version of Buffy the Vampire Slayer. -Toad is a pretty weak and annoying character, but he gets to walk around with his own special hip hop beat in the background. He gets his own rap later on.